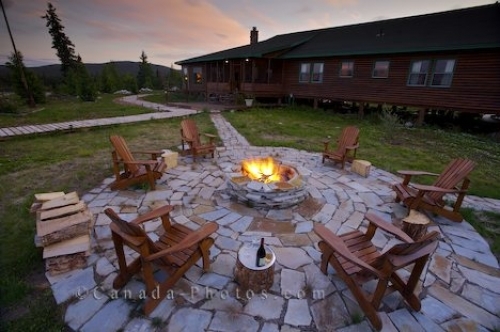 Outside of the Rifflin'Hitch Lodge in Newfoundland Labrador, Canada, the fire pit is aglow with a warm fire for guests who want to enjoy the clean, fresh air of the wilderness that surrounds the fishing lodge. A bottle of liquor and a glass sits on ice on the patio awaiting the guests to arrive so that they can take pleasure in a beverage before darkness closes in. Fire pit, Rifflin'Hitch Lodge, Eagle River, Southern Labrador, Labrador, Newfoundland Labrador, Canada. Picture of the outside fire pit on the patio at the Rifflin'Hitch Lodge in Southern Labrador in Newfoundland Labrador.